Military technologies are becoming increasingly lethal and unpredictable year by year and month by month. There’s more than one alternative. 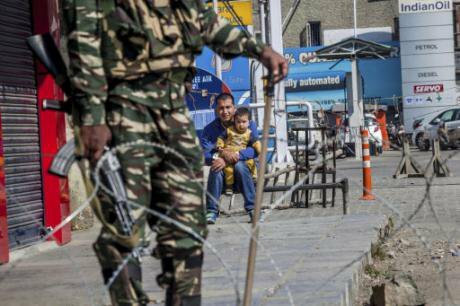 Kashmiri man and child watch as Indian paramilitary soldier stands guard at an temporary checkpoint during curfew in Indian controlled Kashmir, Oct.10, 2016. Dar Yasin/Press Association. All rights reserved.Quite rightly, most efforts to stop war focus on its causes. If the problems can be resolved and war prevented, so much the better. Of course stopping a war doesn’t ensure the end of injustice or oppression and on occasion a ‘just’ war may be the only way to end a tyranny. But in all too many wars the death and damage soon far outweigh the original hurt. The process of lethal warfare generates new reasons for conflict. War is not a great way of managing international security and without such security, it’s hard to create a just and equitable world. I agree totally that to avoid warfare in the future we must improve our current political and economic systems. openDemocracy is concerned with these very issues. But even under the most optimistic scenario armed conflict is not going to disappear overnight. Unprovoked aggression can always be expected. I’m suggesting therefore that we accept that physical conflict between nations is at times inevitable but try to reduce and even eliminate its damage. We can do this by constraining aggressors with nonlethal devices. I’ve found that a number of peace activists are suspicious of this approach. They argue that it distracts from the main aim of doing away with war. They also say, with some justification, that any kind of warfare – even without death or injury – is a manifestation of violence. Bearing these objections in mind, let’s look at the possibilities of a nonlethal approach to international security. Towards the close of the twentieth century, we were quite optimistic about the state of conflict around the world. The USSR crumbled away, the nuclear stockpile diminished and democratic government appeared to be spreading. Today, the mood is much more sombre. War in the Middle East and Africa continues while cities around the world are threatened with terrorist bombings. Nuclear disarmament limps along and remote warfare poses new threats. But we don’t seem to have changed the way we try to solve these problems. When conflict breaks out, nations still respond with technologies that kill or injure humans. Despite the mighty failures in Afghanistan and Iraq, the United States coalition boasts the killing by airstrikes over the last several years of more than 30,000 ISIS combatants in Iraq and Syria. Leaving aside all the civilians who must have perished, this crude slaughter has not resolved the conflict and has probably made matters much worse. Not surprisingly death and injury generate anger as well as sorrow. Leaving aside any moral concerns, making peace becomes much harder. A completely different approach - the development of nonlethal technology - could offer us a major opportunity to break out of the deadly spiral in which we are trapped of creating ever more lethal weapons. The concept is not new. Nonlethal protection has been around almost as long as warfare – think of shields and armour – or even of a thorn fence around the tribal compound. Nonlethal tactics have been with us for as long as we’ve been taking prisoners of war. New interest in the notion of nonlethal warfare emerged in the USA in the 1960s, supported by such figures as American marine John Alexander and peace activists Janet and Chris Morris. Alvin and Heidi Toffler’s 1993 book ‘War and Anti-War’ gave further publicity to the idea. Progress since then has been uneven. Initially there was great enthusiasm. At last, it was thought, we could have a ‘war without blood’. The US Defence forces became involved and invested substantial resources. Other military agencies across Europe set up Non-Lethal Weapons (NLW) development units. Academic institutions, such as the University of Pennsylvania and the University of Bradford, established NLW Centres. Before long though, as with many innovations, problems soon emerged and some of the glamour faded. One major problem was the lack of effective nonlethal devices – a chicken-and-egg situation. If you don’t have nonlethal devices it’s hard to develop nonlethal strategy. If you’re not practicing nonlethal techniques, there’s no market for the devices. In recent years there’s been a renewal of interest. Various military establishments across Europe have been developing nonlethal research units. So also have a number of civilian organisations such as the British Home Office, which looks at the use of nonlethal devices by the police. As you might expect, the largest nonlethal weapons agency of all is in the USA – the Department of Defense Non-Lethal Weapons Program. This is run by the US Marine Corps at Quantico in Virginia. It carries out significant research on nonlethal approaches and develops and tests a range of devices. We can say that every car at a road-block halted and not machine-gunned by soldiers represents lives saved. Each citizen tasered instead of being shot dead by police is another success for nonlethal security. There’s a long way to go of course. It may take time before we can deter well-armed fanatical combatants without employing lethal force (or, for that matter, to persuade them to trade in their AK47s for stun guns). There are other problems. Quite frequently, used in the wrong way, so-called ‘nonlethal’ devices can cause severe injury and – yes – death. Often, they do not deter aggressors. Baton rounds (aka ‘rubber’ bullets) have killed a number of people. Although the majority of the 900 hostages survive, 128 people died in the Moscow theatre siege by Chechnyan terrorists in 2002. The authorities employed a paralysing gas but did not make proper arrangements for the antidotes. First, if no one is killed there’s always an opportunity for justice and reconciliation. But once there’s a death, there’s no going back. Second, the elimination of death and injury in war could quite possibly set the scene for a less violent culture across the whole spectrum of human activity. At present, a major obstacle to any advances is lack of money. If society were to make a determined commitment to nonlethal security, the resources to develop the technology would be found. But of course we would first need the commitment. Governments would have to be persuaded to reallocate a portion of their military budgets to nonlethal technology. There’s no question that humans have the all skills required to develop the technology. We are incredibly clever and resourceful when we want to be. For example, the scientists who very recently proved the existence of gravitational waves used instruments that could theoretically detect whether our sun had moved in space by the breadth of one human hair. In contrast, police officers in many countries are still equipped with primitive handguns. To date, there’s very low awareness of the concept of a nonlethal approach. For many people ‘nonlethal protection’ means tricky gadgets used by civil authorities to subdue the public. There’s probably even less awareness of the idea of military nonlethal force. That there could be a nonlethal approach to warfare is for most people still science fiction. Overall, progress has been slow, Does this matter? You might argue that it’s more important to change the world order to a more democratic equitable structure, to tackle climate change and to eliminate nuclear weapons. Warfare will then disappear by itself. In an ideal world, political processes would improve and we’d eventually achieve lasting world peace. I believe that we do not have the luxury to delay. Military technologies are becoming increasingly lethal and unpredictable year by year and month by month. If we do not soon halt today’s lethal arms race, there’s the risk that war could spill over into a nuclear conflict and all the carnage, radioactivity and long-term damage that would entail. To conclude, nonlethal security is not only about technology. It’s about a different mindset. Looking at another major issue for humanity: to arrest and reverse global warming, we’ll need to employ various new technologies for generating fossil free energy and removing carbon from the atmosphere. We’ll also require massive alterations in human behaviour and in the political and economic processes which govern it. I suggest that to achieve a just and peaceful world we’ll need to transform the current technology of war and of course in this area, too, we’ll have to achieve substantial changes in human behaviour and in the way we manage it.